In late 1961, designer Carl Alberg was commissioned by Kurt Hansen, owner of Whitby Boatworks Ltd. of Whitby, Ontario, Canada, to design a 30’ sailboat for a group of Toronto area sailors who were interested in a boat in the 30’ range for class racing and family cruising. The plans for what has become known as the Alberg 30 were completed in 1962. Before the days of computer-aided design, it took weeks for a designer to produce a set of hull lines and the calculations to evaluate a design. For this reason, it was common for naval architects to pattern much of their work after proven prior design work. Carl Alberg was no exception, and many of Alberg’s designs are similar in appearance. With her full keel, low free board, long overhangs, narrow beams, and low-aspect sail plan, the Alberg 30 design is vintage Carl Alberg. Although the design of the A-30 was based loosely on the "Odyssey," a boat Alberg had designed for a group of San Francisco area sailors in 1959 (15 were built), the likeness to other Alberg designs, from the Cape Dory Typhoon to the Pearson Triton, is unmistakable. 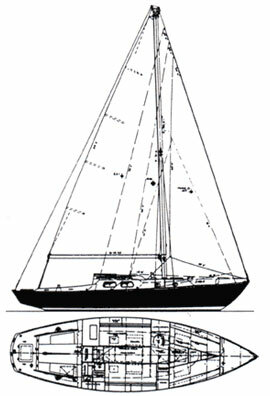 In 1964 a group of Annapolis-area sailors banded together in order to purchase, as a group, several of the new Alberg 30 design. The first of the Annapolis group’s vessels were delivered in 1965, and the Chesapeake Bay Alberg 30 One-Design Association, Inc. was born. The Alberg 30 was in continuous production from 1962 through 1984 by Whitby Boatworks. The 22-year production run of more than 750 boats is, to the best of my knowledge, unprecedented in the marine industry. Over three hundred of these boats were delivered to the Chesapeake Bay; many of which still sail the Bay and its tributaries. The construction of the Alberg 30 hull consists of a solid lay-up of fiberglass cloth and polyester resin. Iron ballast is encapsulated in the full length fiberglass keel, and a fiberglass composite rudder is attached to the keel. Decks and cabin houses are constructed of fiberglass cloth and resin, and a core was used in areas of the deck and top of the cabin house for added strength. Boats built prior to 1970 utilized masonite as a core material, while those built after used balsa wood. Fundamentally the Alberg 30 is a very solidly built fiberglass boat. Many have completed extensive offshore passages, and at least one has a circumnavigation to her credit. Most problems commonly associated with Alberg 30s can be attributed to normal wear and aging of a vintage boat. These include leaking ports and fittings, balsa wood deck core that has deteriorated through water saturation, and worn rudder pintles, gudgeons and bushings. There are several areas where questionable design and construction seem to have led to problems. Prior to the 1970 deck change, Whitby utilized a laminated wooden support beam beneath the deck step mast. This beam was subject to cracking and failure after hard use. Most boats of this vintage have been retrofitted with an aluminum plate to add support to the area. This repair is common and seems to have solved the problem. Another weak point of the Alberg 30 design seems to have been the attachment of the forward lower shroud chain plates to less than substantial support knees. One quarter-inch bolts used to attach the chain plates for the upper and lower shrouds should also be inspected thoroughly for signs of bending or elongation. Originally, the Alberg 30 was powered by the 22 horsepower Gray Marine gasoline engine. This was followed by the Universal Atomic 4 engine and, in the later years of production, A-30s were offered with diesel engines. First were the single cylinder Bukh diesels, followed by two cylinder Volvo Penta marine engines. As may be expected, many A-30’s have been re-powered over the years, but there are still plenty with their original engines. The condition of older engines depends greatly upon the care and maintenance they have had over the years. The Alberg 30’s rugged construction, classic styling, seaworthy design, and admirable sailing qualities aside, the number one attraction of the Alberg 30 remains an active, enthusiastic, helpful, and friendly owners’ association which has endured for more than thirty years. The Chesapeake Bay Alberg 30 One-Design Association, Inc., which has about 250 members, produces a monthly newsletter and an annual handbook, conducts springtime educational and maintenance seminars, organizes an annual dinner, and promotes numerous races, cruises and rendezvous annually. The value of the strong owners’ association, particularly for those considering an older boat needing some work, can’t be overstated.